This Post Is About The Final Stage In Using Magic. Each stage Is outlined In Introduction To Magic. More details: Purpose, Correspondences, Materials. After you’ve decided your purpose or what you want to have happen, decided what symbolism and correspondences will help, and found the materials you need to bring your intentions into the physical realm, you are ready to work the magic. There are a few methods you can use to do this. This will depend on what form your magical working will take. 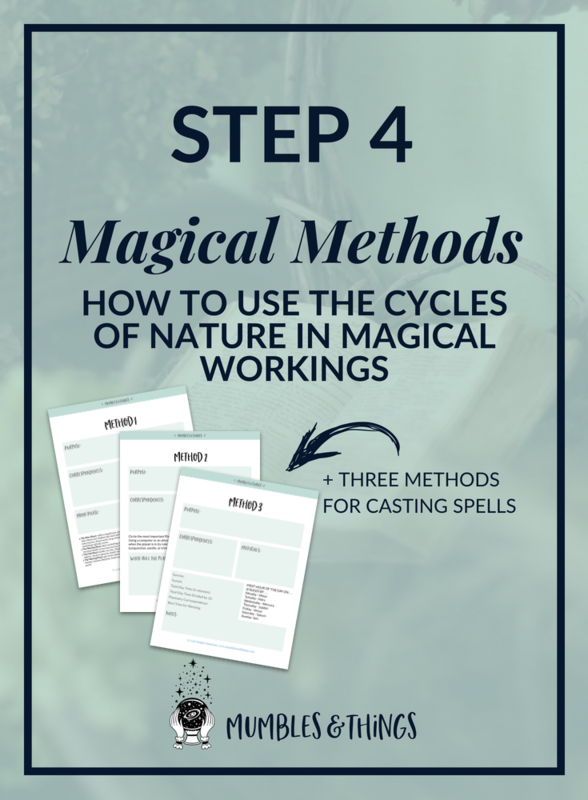 Whether your plan to make an amulet, brew a potion, burn incense, perform a spell or ritual, or something else, you will need to learn how to combine the purpose, correspondences and materials. In magic, the timing of your magical working can guarantee a success. The Principle of Rhythm taught us that there is a cycle and a pattern to every process in our universe. Magical power is no exception: magic cycles through various levels of intensity over time. Your magic can be more powerful, work faster or more effectively, when magical energy is high. We’ll look at three ways to figure out the proper timing for your magic. A simple method to time your magic is to follow the phases of the Moon and the seasons of the year. The Moon cycles through phases, from new to full and back in about a month. Magical energies are weakest at the New Moon. As it waxes the energies increase to a maximum when the Moon becomes full. The energies decrease as the Moon wanes back to a New Moon. As such there are times when certain types are more appropriate than other times. The solar cycle is reflected in the change of seasons and repeats each year. Depending on latitude and other factors the dates of the changes in seasons may be different. Generally in the northern hemisphere the cycle of seasons follow the patter below. You may be thing at this moment, "But, I don't have a worksheet to organize my thoughts and notes while using this method to build a spell." I was hoping you'd say that, which is why I built one for you. Scroll down, fill in the form, and receive your worksheet to your email inbox. To use this method you will need to use an astrological calendar to track the movement of the moon, sun and planets in relation to the signs of the zodiac. It sounds complicated, and astrological calendars may look confusing at first glance, but it’s not. All you really need to know is how to look up a planet to find which sign it’s in. Work your magic when the principle planetary correspondence is strong. Generally, a planet is strong when it is in a sign that is one of it’s rulerships or its exhaltation. In contrast, a planet is weakest when its in a sign that is one of its detriments or falls or when it is in retrograde. You wish you had a worksheet for this method too, don't you? Well lucky you, I made a different worksheet for the astrology approach. You can have both for FREE! This is a more complicated method than either of the others. It require more mathematical skill to calculate both the planetary and elemental workings. There are twelve planetary hours during the day and twelve at night just like the regular hours. Unlike regular hours of the day, planetary hours change length based on the season. In other words, a planetary hour during the day is 1/12th of the length of the day and a planetary hour during the night 1/12th the length of the night. Use the method above to find the planetary hours in the night as well. The first hour of the night is governed by the next planet in the sequence. The the next hour is ruled by the next planet in the list. For example, if sunrise on Monday is at 6am, and each hour is equal to an hour (for simplicity sake, this only happens on the equinoxes) the hour from 6am to 7am is ruled by the Moon, the hour from 7am to 8am is ruled by Mars, the hour from 8am to 9am is ruled by Mercury and so on. The elements can also be pulled in. Each one govern a period of 24 minutes, therefore each cycle repeats once every 2 hours. The cycle starts at dawn with Spirit, then Air, Fire, Water, and Earth. As you can see this can become very complicated, very quickly. I personally think it’s pretty interesting to look at, and if I have the time I like timing spell this way. On the other hand, it’s very particular and most of the time I’m too busy to work magic at a specific time. It would be nice to have a worksheet right? Well too bad, you only get two. You're on your own for this one. I'm only joking. You can have my worksheet for method three as well. These three worksheets come in one email. As a reminder, you’re the most important part of any magical working, the timing just adds to the power. I know you're probably tired of hearing this by now, but that doesn't make it any less true. Save your notes and add to them as you learn. You can print a new page every time you plan a spell.